Ancestry.com has a database online that is titled - UTAH, MILITARY RECORDS, 1861-1970 which includes 410 people who listed Greece as their place of birth. 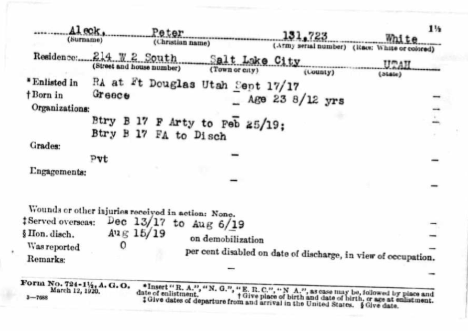 This database contains military records on Utah servicemen and women created or collected by various state government agencies. They include questionnaires, index cards, photographs, and newspaper clippings going back to the days of Utah’s territorial militia. Respondents were also asked to provide a photograph and other clippings or relevant materials. In 1942 the Utah State Historical Society began creating a record of Utahns’ military service in World War II. In 1957, the scope was broadened to encompass all Utah veterans, and this collection includes sets of index cards extracting records from the Spanish-American War through Vietnam, though cards for Korean and Vietnam are not comprehensive. Veterans may be found in more than one card set. Some cards may list as little as a name and address, while others include extensive personal and military service information: birth dates, marital status and wife’s name and address, next of kin, burial place, unit information, places and dates of enlistment and service, discharge details, etc. This scrapbook was compiled by the governor’s office during the Spanish-American War and documents events related to Utah and the war with newspaper clippings. Other details, such as a pension claim number or burial information, are sometimes included as well. The cards are not a comprehensive list of all members of the territorial militia.